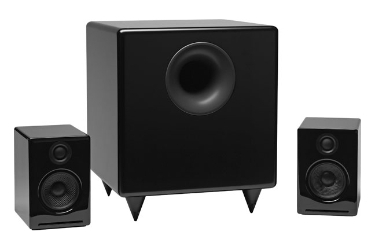 The AudioEngine 2 speakers are sold as desktop computer speakers but they are not. If used that way they will not sound the least bit natural. They will not be allowed to breathe. Every British style monitor speaker needs to have room the breath. Yet, these are not British style monitors. Oh yes, they are. They need to be freestanding and placed out in the room with no surfaces or furniture around them. They should be placed on appropriate speaker stands away from the walls of rooms. These speakers are very much along the lines of the LS3/5a’s. They are small for a reason. Small baffle means less cabinet edge reflections and better dispersion. Small drivers mean a better acoustical match between drives with less phasing problems. Rigid cabinets mean less box resonance. The little AudioEngines do not follow the acoustical sealed bass drivers as the LS3/5a’s. They have slotted loaded bass drivers made of Kevlar. When slots are well designed they can approximate transmission line enclosures to a modest degree. At the very least such a design can significantly boost bass output. For such small speakers the 2’s can sound bass heavy if setup improperly. Bud Fried helped pioneer the transmission line speaker along with his British partners at IMF. (Bud got into trouble with them when he started building his own versions and variations to which IMF did not agree.) He built a very large speaker system called the Model H based on the original LS3/5a design. The satellite speakers were small but the H included a separate large subwoofer module with dual bass drivers loaded in transmission lines. The speaker system was quite impressive, especially for its bass output, though the midrange was not nearly as smooth as the LS3/5a’s. Fried went to produce slot loaded speakers as a variant of the true transmission line speaker. Some of the designs were quite good in their day. Returning to the slot loaded idea, the AudioEngine 2’s capitalize on this theme quite well. It produces hefty bass where there is bass. But of course, their 2.75″ Kevlar woofer cannot really descend the depths of a pipe organ or even a grand piano. This is where a subwoofer is needed. Fortunately AudionEngine makes a very fine matching subwoofer for its little boxes. The subwoofer will not only add in the missing very low bass but will also improve power handling and reduce the load on the midrange/tweeter, allow greater spl’s with potentially reduced distortion. 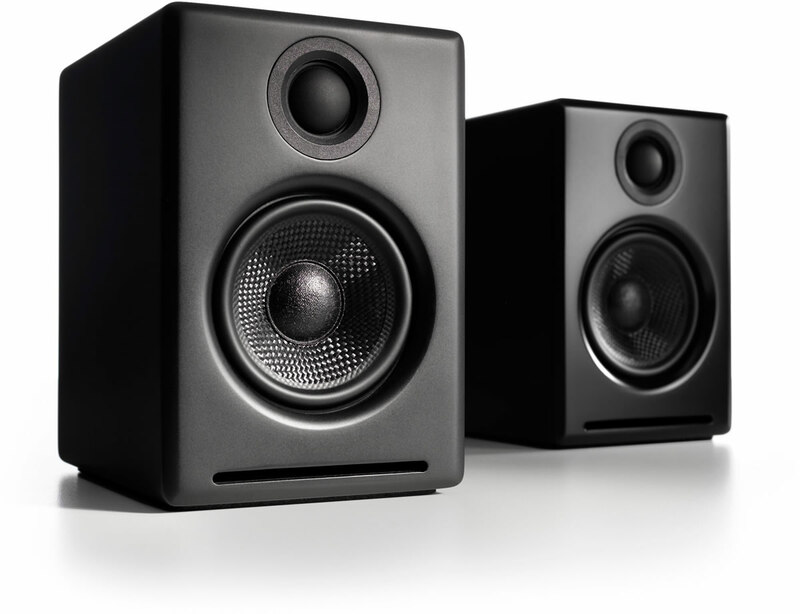 The A2’s are self-powered which greatly reduces the overall cost of an audio system. Fortunately the class AB designed amplifier contained in the left speaker is quite good and its power is adequate for a small room to medium size room. Of course, adding the subwoofer ups the ante a considerable amount. The price of a pair of A2’s is an incredibly low $200. The optional AudioEngine S8 Powered Subwoofer is priced at a reasonable $349. There are some other nice sounding speakers on the market for around $200, but few that are self-powered and fewer still that do not adversely color the human voice. Audioengine uses Ferro fluid cooled, silk dome tweeters with Neodymium magnets. The woofers are Kevlar woven glass aramid composite with rubber surrounds. Kevlar is very strong which means that the woofer retains its shape when being driven hard. The cabinets have thick high-resin MDF walls with extensive internal bracing to minimize unwanted resonances and distortion. Heavy internal sound-damping material is used to reduce unwanted sound reflections inside the cabinet. All cabinet edges are rounded to reduce high-frequency diffraction effects on the front baffles. Both speakers are tuned and tested together and sold in pairs. How do the speakers sound? They are very musical indeed. They are not so transparent that they reveal every detail or flaw on one’s front end audio components. (There are speakers at higher prices which do that and still sound musical, though all of them do not.) Some believe that “musical” means colored but that is not so much the case here. These speakers are quite neutral, especially on human voice which is essential. They are also revealing of the source material. They image quite well and their sound is clearly defined and articulate. They do not call attention to themselves. The 20 mm soft-domed silk tweeters are smooth and extended. They cannot compare to a ribbon tweeter, however. (That is especially where Magnepan and certain electrostatic speakers have the upper hand.) The tweeters do blend well with the woofer/midrange drivers. This is not always the case with many expensive loudspeakers. What type of source material should one use with these speakers? The very best! They are better than the compressed sound coming off one’s iPod. However, they will allow this music to sound at its best and will not necessarily trash it. Even so-called high-resolution source material could sound like trash if not recorded well. The A2’s are quite easy to set up. Everything is provided by the manufacturer including cables and power supply. There is a volume control on the rear of left speaker, but once set it will probably not need frequent adjustment. Volume will normally be controlled by a preamplifier, computer, or another input device. These speakers should be auditioned by anyone who is looking for superior sound at a very reasonable price. Many reviewers have misunderstood this product. Kudos to Stereophile for a very fine review. I have these (not the newer A2+). Is there an economical sub for these that has a crossover built-in? I’d like to not send any audio <100Hz to the A2's at all. You will need an external cross ever. This would be ideal but expensive.